Los Angeles residents are bracing for this weekend’s “Carmageddon,” when 10 miles of the city’s notorious 405 freeway will close for construction and leave many Angelenos stranded in their own pockets of town. Solutions to the madness are many: Adventure Helicopters is hosting VIP tours above the freeway for $400; the same company is selling shared helicopter rides from Westside to the Valley for $150 one-way ($275 round-trip); and the SLS Beverly Hills is offering a 405 Staycation Package for $405/night (a $95 savings), complete with free valet parking, so you don’t have to think about your car at all. You could also take the bus or subway, since Los Angeles County transit authority is waiving fares for the weekend, but for those residents who refuse to do so, JetBlue has a pretty economical solution: Fly across town! 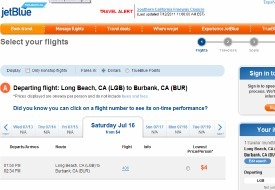 The budget airline is selling flights between Burbank and Long Beach (and above the 405) for a measly $4 and $5 each way – about what you’d pay for one gallon of gas. Even Long Beach Mayor Bob Foster is on board with the “planepool,” as JetBlue is dubbing its weekend service. "I congratulate JetBlue on taking their customer service to new heights by providing alternatives for travelers in the L.A. Basin during 'Carmageddon' weekend," Foster said in a JetBlue statement. "JetBlue's solution to Carmageddon will allow everyone in the L.A. Basin to visit Long Beach this weekend and enjoy a weekend of fun on the beach just a quick flight from Burbank." The $4 ticket covers a basic seat in economy, including taxes, fees, and as many bags of Terra Blue Potato Chips as you can chow down during the 45 minute flight; upgrade to the “Even More Space” fare for just $5, also inclusive of taxes and fees. Tickets are on sale through Saturday, though we suggest booking before they fly away.